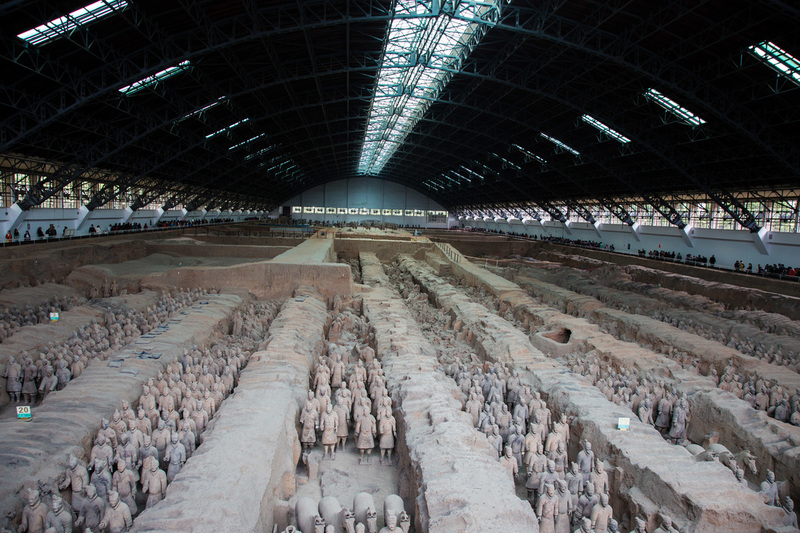 DAY 1: The Terracotta Army is a part of a massive burial tomb built for Emperor Quin Shi Huang, the first emperor of China. 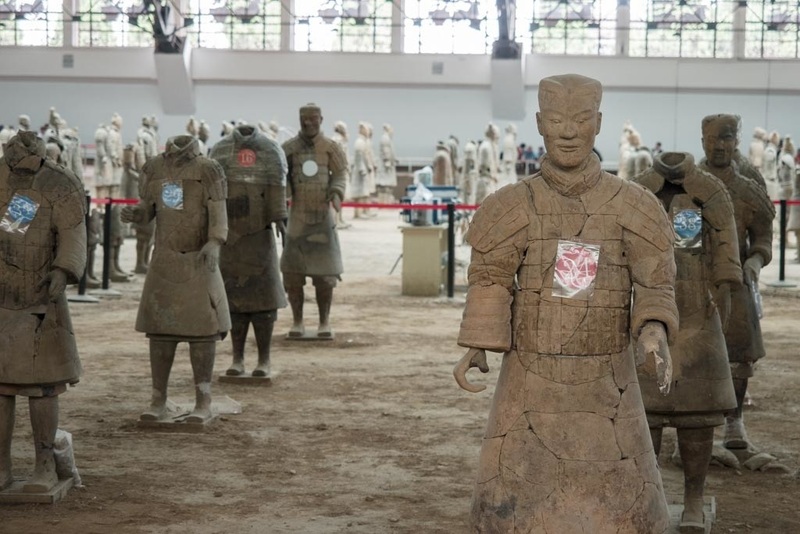 There are over 8,000 life size statues of soldiers buried along with the emperor. 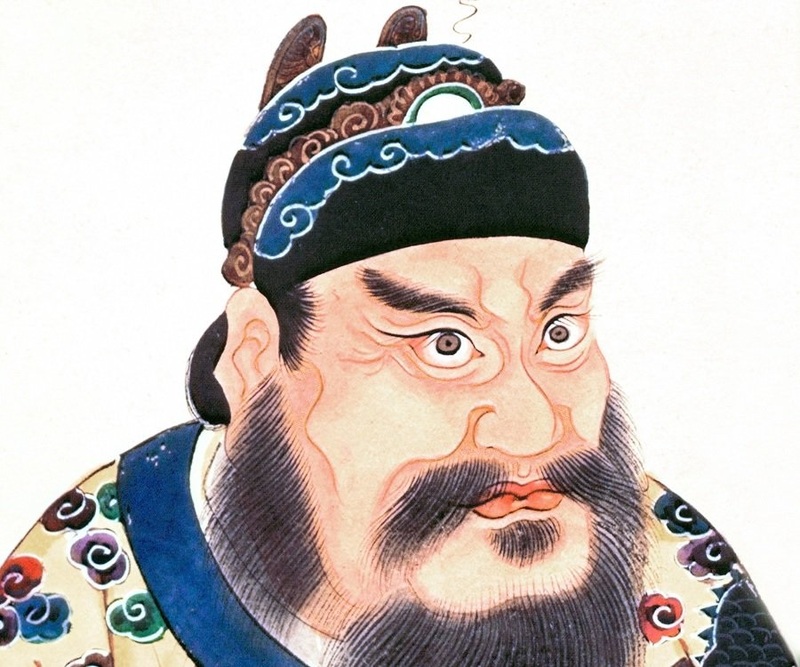 Emperor Qin wanted to live forever. He spent much of his life and resources searching for immortality and the "elixir of life". He also spent a huge amount of resources building for himself the largest single tomb built to a leader in the history of the world. He felt this huge army would protect him and help him to keep his power in the afterlife. He died and was buried in 210 BC, over 2000 years ago. 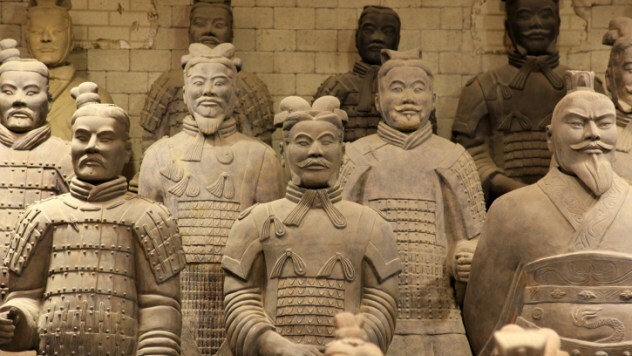 The soldiers of the Terracotta Army are life-size statues. They average around 5 feet 11 inches tall with some soldiers being as tall as 6 foot 7 inches. Despite there being so many statues, no two soldiers are exactly alike. There are soldiers of all ages with different ranks, facial features, and hair styles. Some of the soldiers look calm, while others look angry and ready to fight. The soldiers were even designed with different clothing and armor. Men from the cavalry are dressed different than foot soldiers. Some soldiers don't have armor. Perhaps they were supposed to be scouts or spies. DAY 3: How did they build so many soldiers? 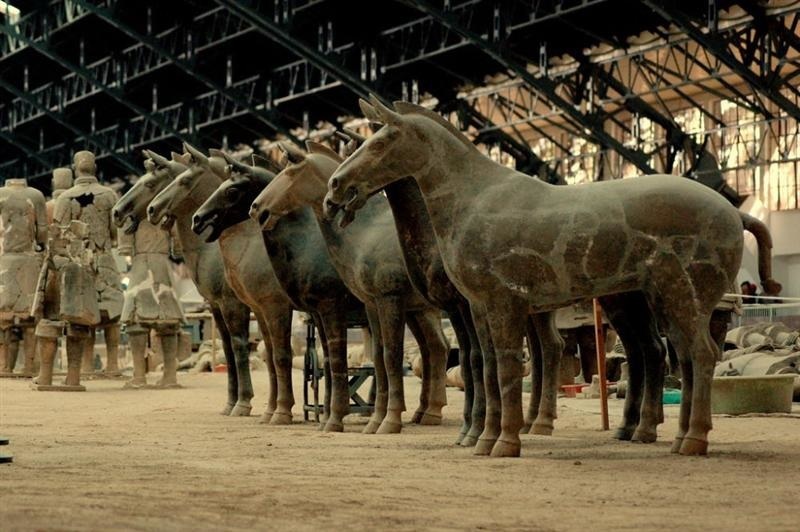 To build 8,000 life size statues must have taken a large army of workers. 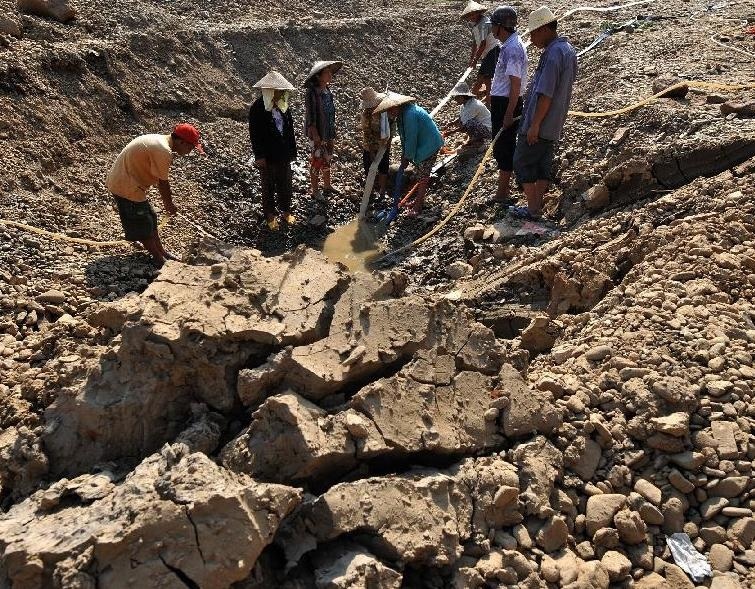 Archeologists estimate that over 700,000 craftsmen worked on the project for several years. The bodies of the soldiers were made in an assembly line fashion. 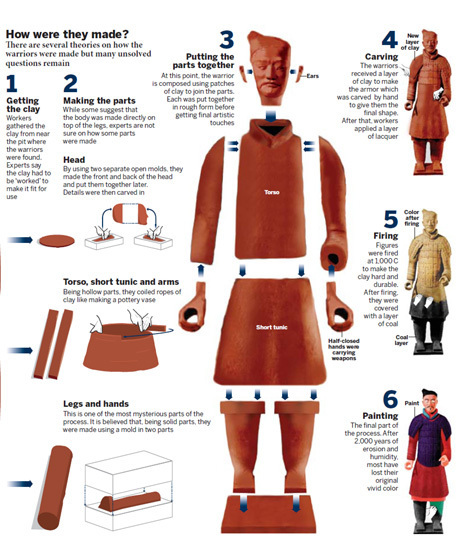 There were moulds for the legs, arms, torsos, and heads. These pieces were then assembled together and custom features such as ears, mustaches, hair, and weapons were added later. 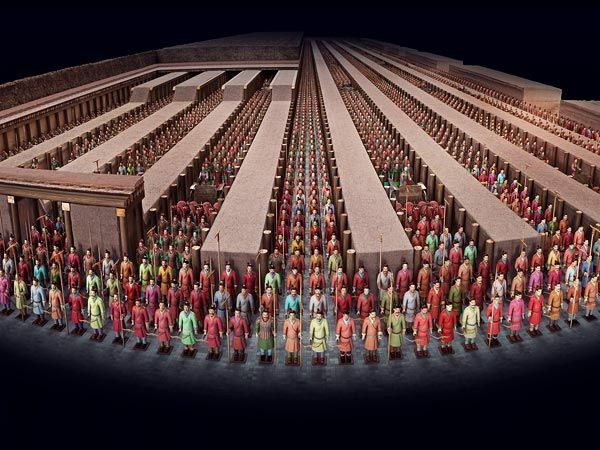 "Terracotta Army Emerges In Its True Colors". Usa.chinadaily.com.cn. N.p., 2016. Web. 19 Apr. 2016. 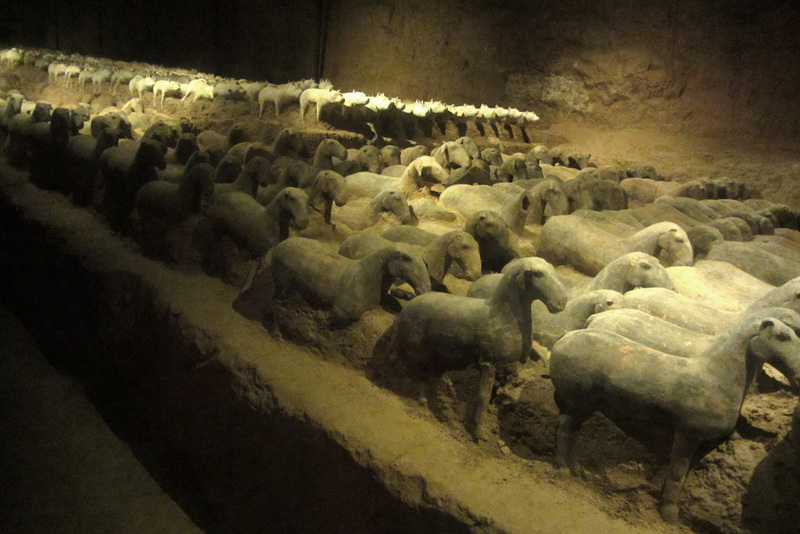 The tomb is most famous for its large rows of soldiers, but there were plenty of other statues to accompany Emperor Qin in the afterlife, including animals. 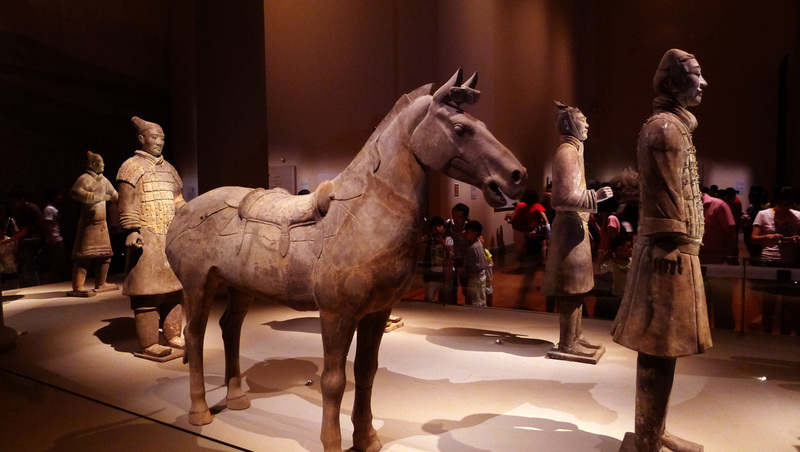 There were 150 life-size cavalry horses and 130 chariots with 520 horses buried with the army. In other areas of the tomb, figures of government officials and entertainers have been found. When was the army discovered? The horses in the army are saddled. 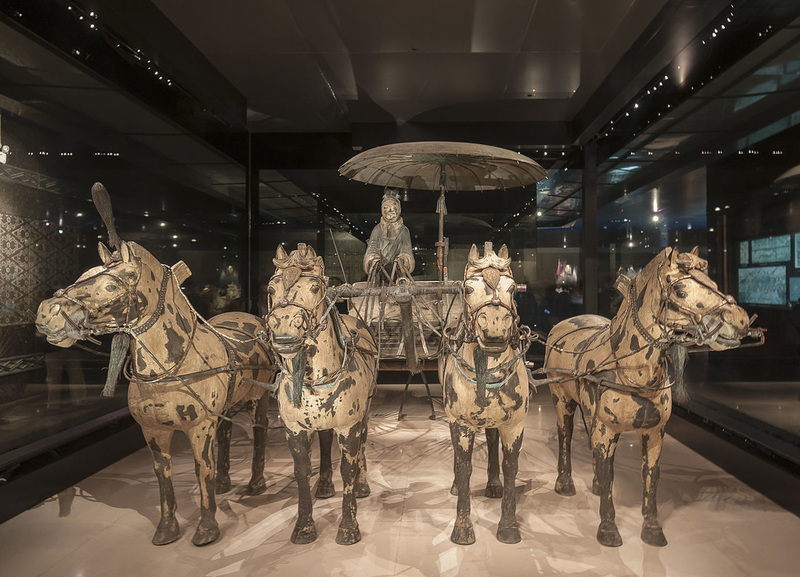 This shows that the saddle had been invented by the time of the Qin Dynasty. 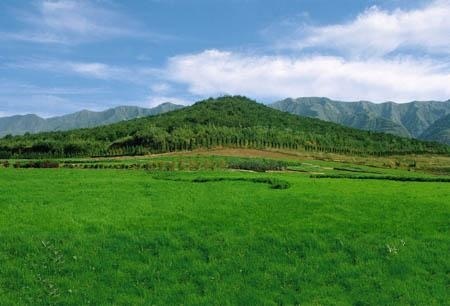 There are four main pits that house the army. They are around 21 feet deep. 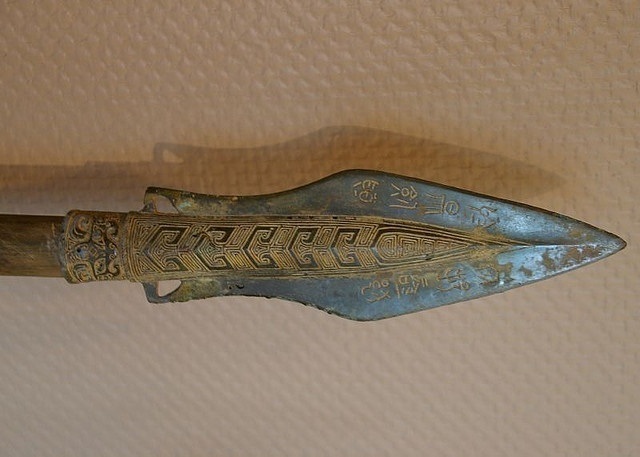 The bronze weapons of the soldiers were found in excellent condition because they were coated with a thin layer of chromium which protected them for thousands of years. Most of the statues were found broken into many pieces which archeologists have been carefully putting back together for many years. 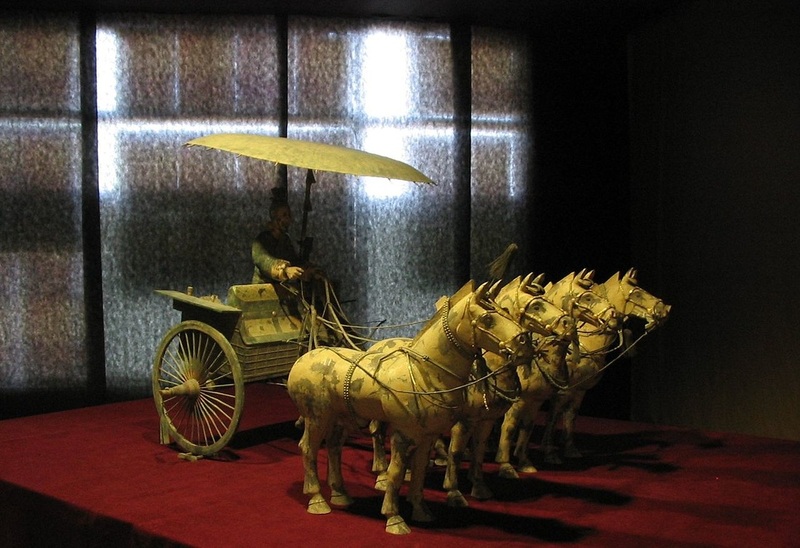 Terracotta is a common type of hard-baked clay. 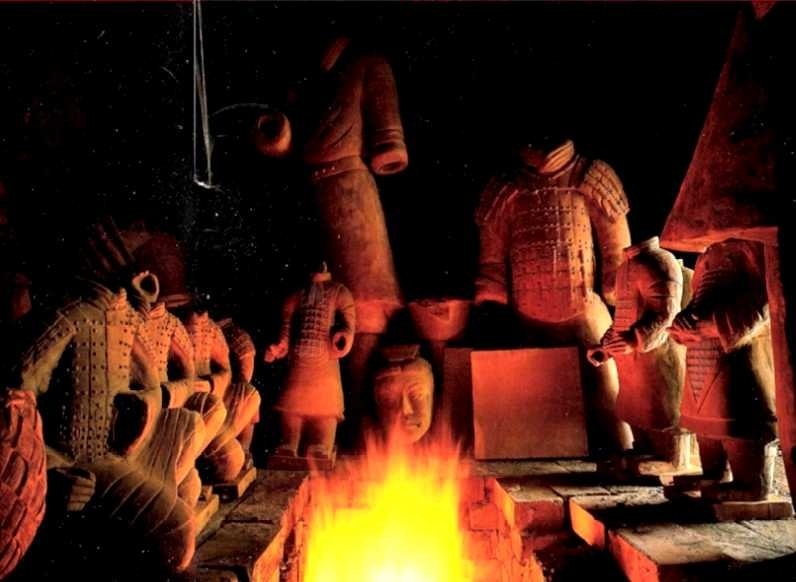 Once the soldiers were shaped with wet clay, they would have been allowed to dry and then baked in a very hot oven called a kiln so the clay would harden. Martinón-Torres, Marcos et al. 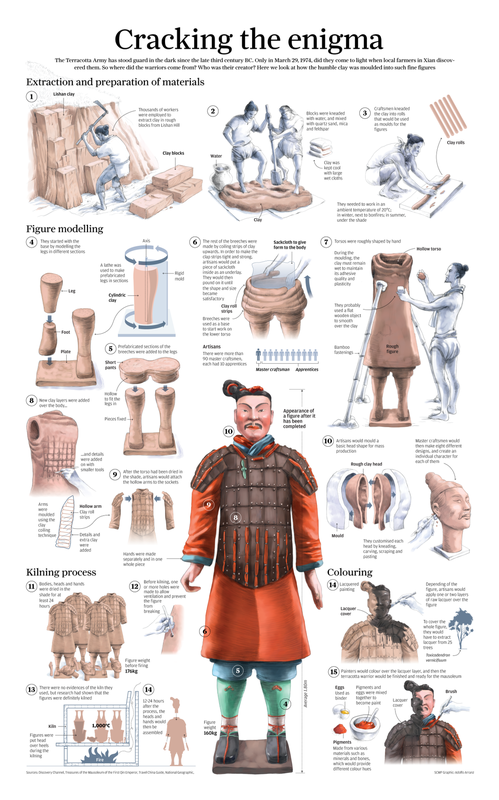 "Making Weapons For The Terracotta Army". Archaeology International 13.0 (2011): n. pag. Web. 19 Apr. 2016. Nelson, Ken. " 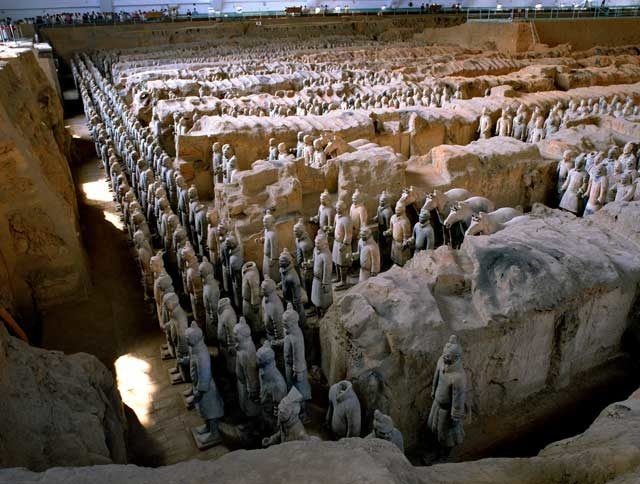 Kids History: The Terracotta Army of Ancient China ." Ducksters. Technological Solutions, Inc. (TSI), Apr. 2016. Web. 16 Apr. 2016. 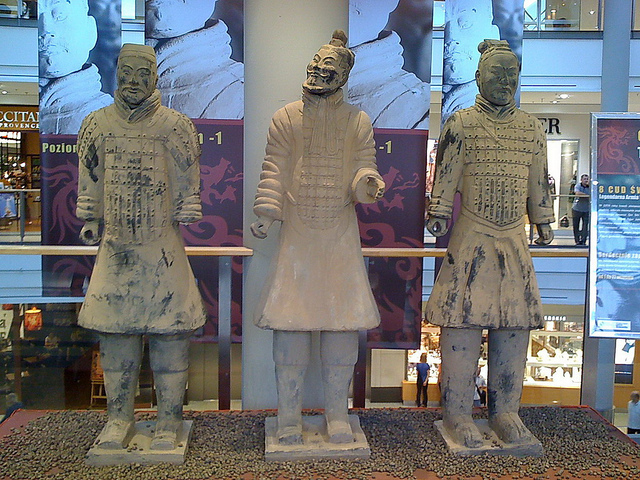 < http://www.ducksters.com/history/china/terracotta_army.php >.